Bonding over good food with good people is the way legendary actor and American icon John Wayne liked to live his life. The John Wayne Cookbook, launched May 5th, 2015. The Official John Wayne Way to Grill is filled with meals to bring family and friends together, delivered in Duke’s trademark no-nonsense style. The grill book, published by Media Lab Books, features 100+ recipes including starters, steak, chicken, fish, pork, burgers, dogs and sides including selections straight from the Wayne family archives. 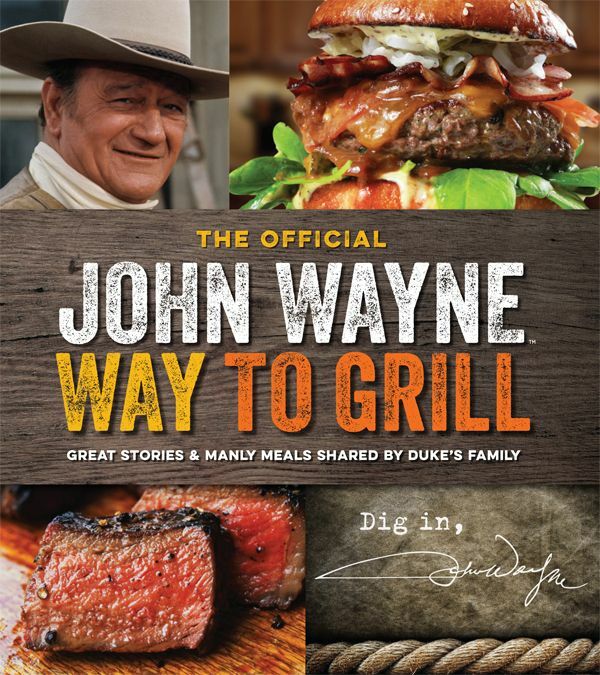 The grill book is also filled with Wayne family tips on how to get the most out the recipes along with insight into Duke’s life. The Official John Wayne Way to Grill retails for $22.99 and is available for sale at book stores nationwide as well as select mass merchants and supermarkets. John Wayne Enterprises’ mission is to preserve and protect the name, image, and likeness of John Wayne by associating the John Wayne brand with quality and timeless products and experiences that embody the spirit of John Wayne and give back to the community.